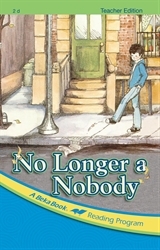 Read along with your child with your own copy of No Longer a Nobody. This optional text will help you keep your child engaged with an introduction to each chapter, enrichment ideas, and character building themes. Guided reading and comprehension questions plus additional vocabulary practice will help you to help your child.